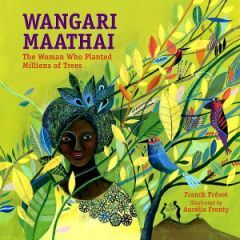 Wangari Maathai: The Woman Who Planted Millions of Trees by Franck Prévot and Aurélia Fronty (illus.) joins the list of picture books about The Green Belt Movement and its founder, Nobel Peace Laureate Wangari Maathai. Previous titles about Maathai include Wangari’s Trees of Peace: A True Story from Africa (Winter, 2008), Planting the Trees of Kenya: The Story of Wangari Maathai (Nivola, 2008), Mama Miti: Wangari Maathai and the Trees of Kenya (Napoli, 2010), and Seeds of Change: Planting a Path to Peace (Johnson, 2010). All of the ‘Mama Miti’ authors’ celebrate Maathai’s ground-breaking concept of tree planting as a catalyst for environmental and socio-political action. Each compelling narrative shows and tells what can happen when an individual becomes an agent of change, fights for what is right, and stands firm against detractors. Prévot provides a solid snapshot of Wangari’s early life, her lush village home, her education despite prevailing norms that kept girls at home, her study abroad, her transformation from conservationist to community organizer, and her transition from activist to Nobel Peace Prize Winner. What sets Prévot’s book apart are his frank descriptions of racism Maathai experienced in the U.S. and Kenya and the struggles blacks waged in both countries against discrimination. Prévot also exposes the hypocritical behavior of moneyed Kenyans in the post-colonial period and their collusion with international capital. Prévot champions Wangari’s commitment to change the status quo; to educate her people on the importance of planting trees; her awareness that “change happens slowly,” that the present is “harsh and difficult,” and “replacing hundreds of thousands of missing trees is expensive.” He uses words like “confident,” “determined,” and “stands tall” to characterize Wangari’s resolute spirit and her willingness to keep going undeterred by her critics, including the Kenyan president who is against her efforts. The book informs us that Wangari recruits people from all walks of life to join the Green Belt Movement. They help plant more trees, earning her the name “Mother of Trees” or as fondly called in Swahili, “Mama Miti.” My only criticism of the book is the author’s repeated use of the misleading word “tribe.” For instance: “President Moi tries to divide the people in order to rule. He knows that when tribes fight one another, the president can quietly govern the way he wants.” Substituting the word group for “tribe” in the sentence would have created a powerful understanding of the universality of divide and rule tactics. I highly recommend this book for libraries that serve elementary and middle school children and for home libraries. Young readers may require the use of a dictionary and inquisitive minds may need do additional research on some of the historical facts, but overall that is why this book is unique. It is jam-packed with research possibilities on colonialism, the environment, culture, politics, human rights, and many more. Teachers will find this a very good resource for many subjects and a starting point for more in-depth understandings of different everyday life causes. The past, the present, and the future are skillfully brought together. Wangari maybe gone, but what she started still lives on. Illustrator Aurélia Fronty’s expansive illustrations are deeply abstract but thought provoking. Beautifully crafted, each allows the reader to go beyond the few written sentences on each page. Next story May I Have This Dance?